TBT: John Stewart, "July, You're a Woman"
Last week my TBT was about the Kingston Trio, featuring a song from their early days, when Dave Guard was their lead singer. Some Trio loyalists disdain anything they did after Guard left, but I liked his replacement, John Stewart, as well, and think some of their best albums were made with him. 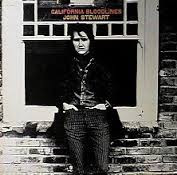 He left the Trio in the late 1960s and made as his debut solo album California Bloodlines, which ranks in my top ten rock/folk albums of all time. I love all the songs on that album, but "July, You're a Woman" is appropriate to the month. John Stewart died a little over seven years ago. I remembered him here, and you can hear two more of his songs by following that link.